I love school vacation weeks. 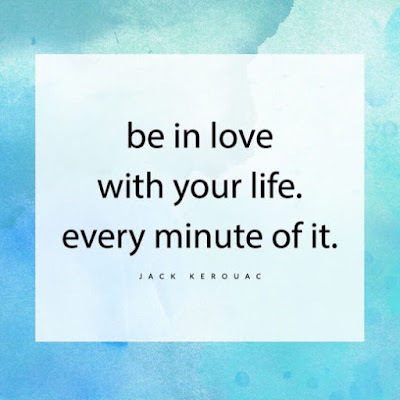 Now, don't get me wrong-- I adore my job and my students but I also love time with my kids where we are not running from one thing to another, or grocery shopping, or doing chores that didn't get done all week... The week off gives us time to get everything done and relax together. 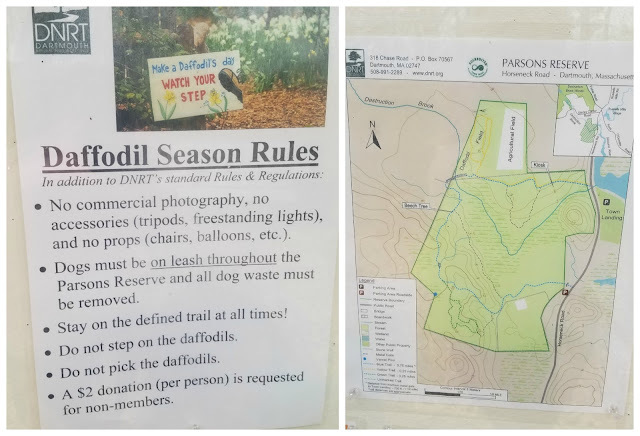 One place I've always wanted to check out but have never had the time is the Dartmouth Natural Resource Trust: Parson's Daffodil Fields. It's literally a field full of daffodils, with paths cut between them all for great views. 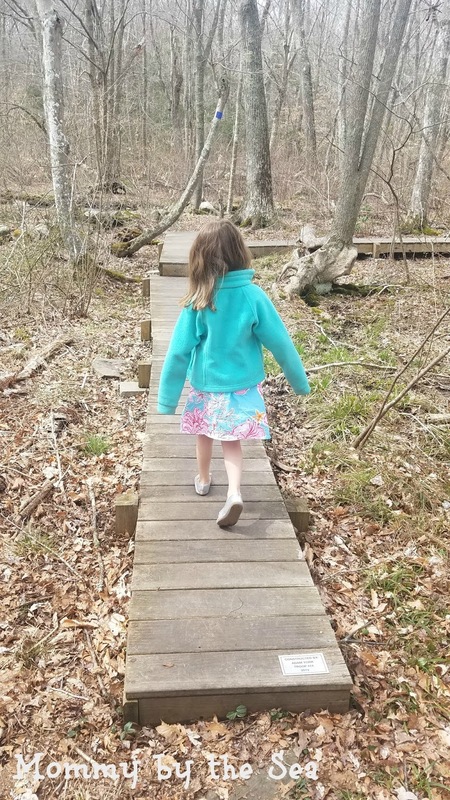 (Be sure to wear good shoes because the path is made of wood chips). 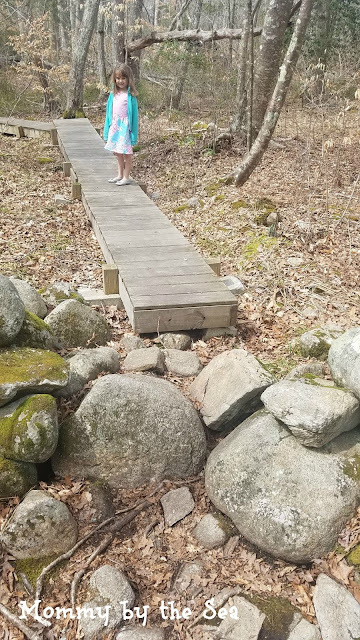 I've always seen photos from others but Emma and I decided to adventure there ourselves. 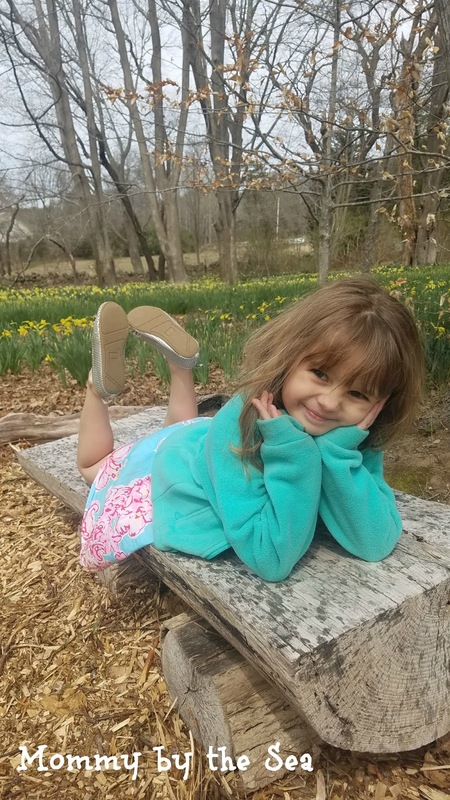 Emmalee asked if she could take some photos and posed herself- I couldn't resist the adorableness! There are a few rules (below) to keep it beautiful, but there was nothing that wasn't easy to do! Stay on the pathways and don't pick the flowers! There is a $2 expected donation for visiting to help with upkeep. 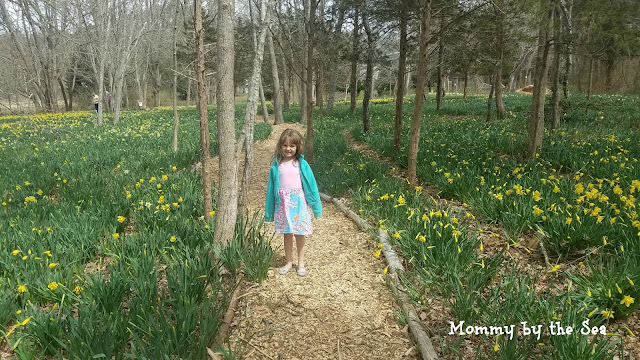 The daffodil fields are about 1/4 of a mile away from the entrance so it's a nice little walk. If you decide you want a longer walk, there is a long walk past the daffodil fields, marked with a blue marker. Lots of the walk are these great wooden walkways, but as you can see, a lot of the pathway is also rocky and uneven. Emmalee and I spent an hour or so walking around looking at the daffodils and and the running water on the blue path; it was such a gorgeous walk! 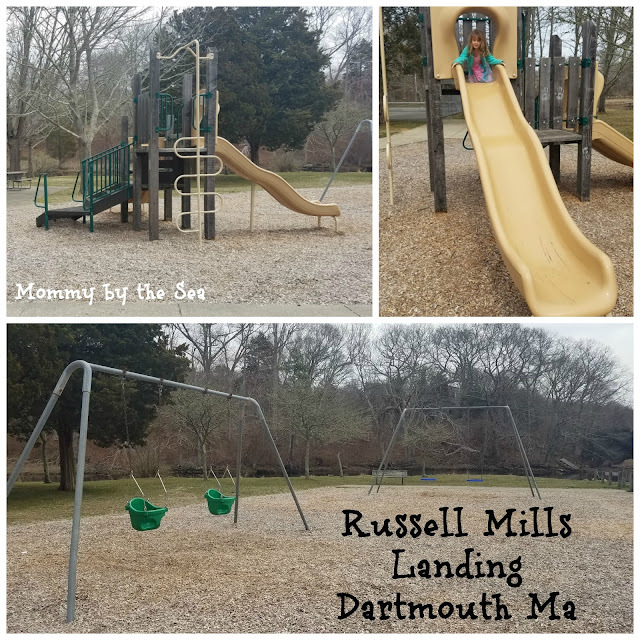 Russell Mills Landing is across the street from the entrance so we stopped at the playground for a bit as well. It's a simple park but has a tennis court, a couple of slides, and both kid and toddler swings. Add in the picnic tables and the views of the river and it's a great place to spend some time with your kids! 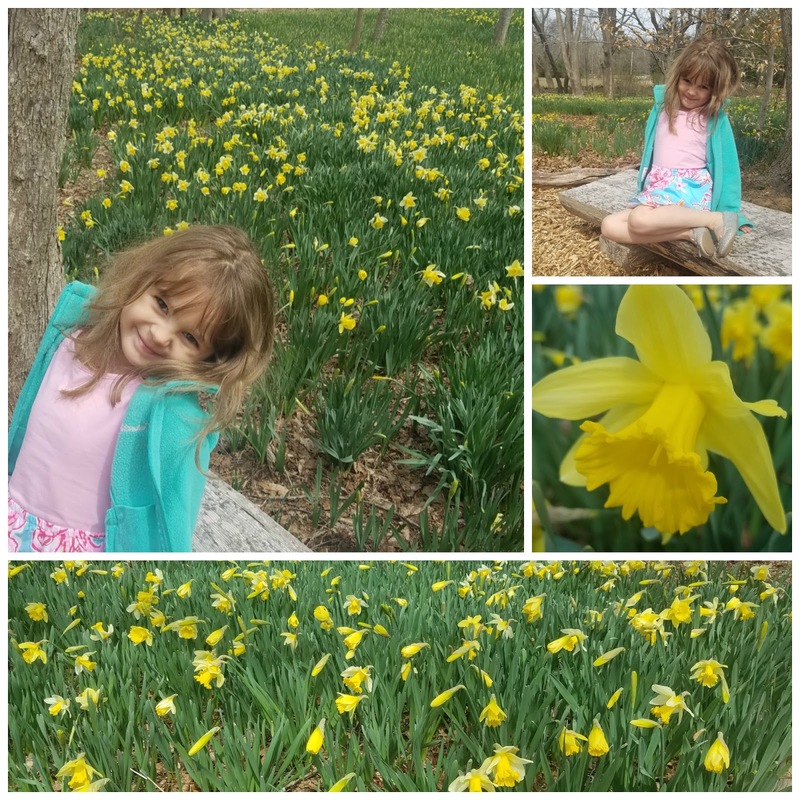 Be sure to hurry soon though-- the daffodils only last until early May! What a weekend! Yesterday was a State Holiday and with Good Friday and Easter, it ended up being a very fun 4 day weekend! 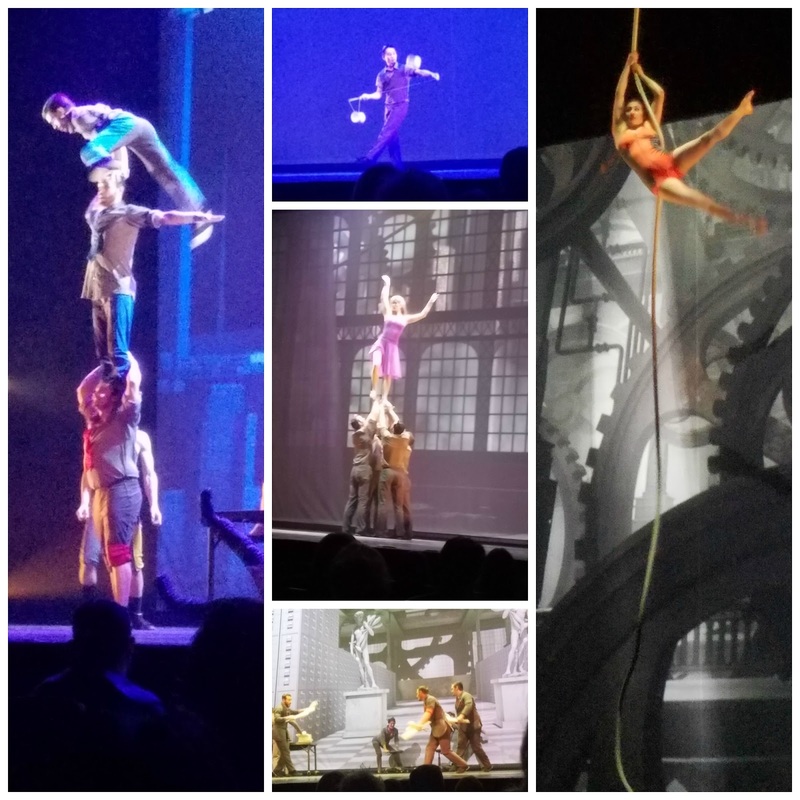 We spent Saturday night with friends at Foxwoods Resort Casino, checking out another Cirque Eloize Show at the Fox Theater. Last year, we saw their show Saloon, and loved it so we were excited to see this show, Cirkopolis. According to the website, With Cirkopolis, Cirque Éloize takes their breathtaking blend of circus arts, theatre and dance to a highly-stylized metropolis setting where multidisciplinary artists rebel against monotony, reinvent themselves, and challenge the limits of the factory-city as only they can. Performing within an inventive stage design and accompanied by an original musical score and video projections, they live in a world where fantasy defies reality—the veil of anonymity and solitude is lifted and replaced by bursts of humour and colour. Cirkopolis transforms the classic film Metropolis into a virtuosic circus spectacle for the whole family. It's such an existentialist piece, starting with a fully industrialized set, and slowly adds in pops of color until the end of the show. I was enthralled the whole time. 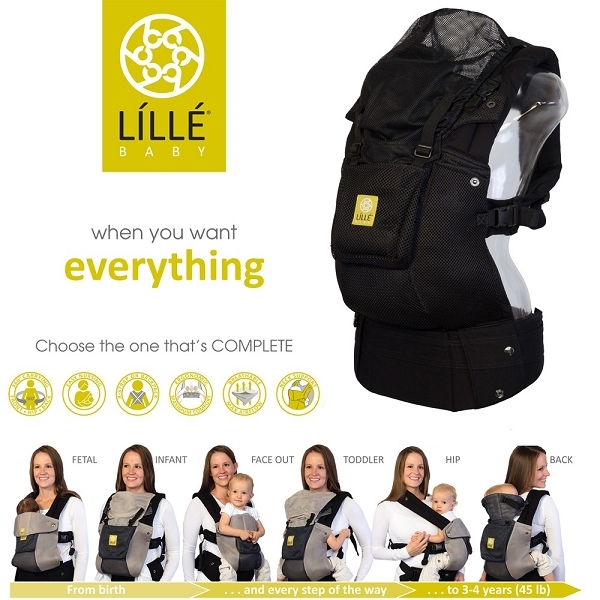 Check out this short video to see some of the amazingness that you'll see! I absolutely love the Chinese Pole and was so excited when I saw it come out, but fell in love with the German Wheel this time! I had never seen that before! 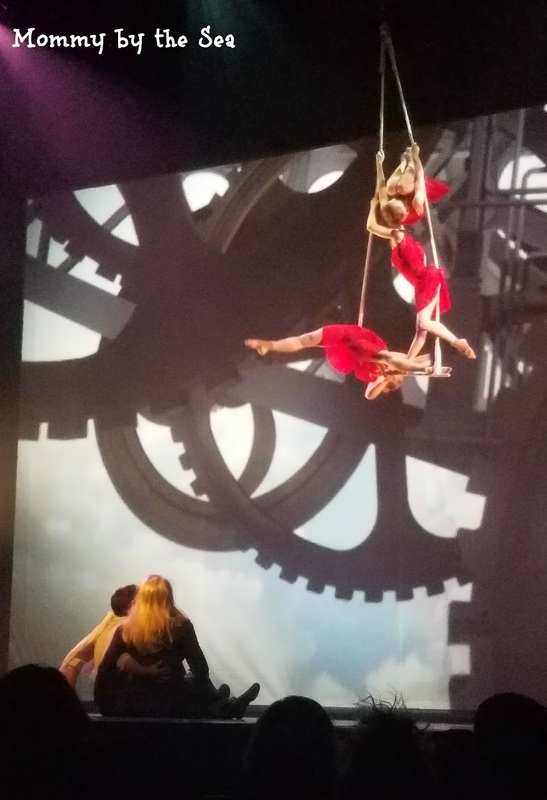 The two friends we went with had never been to a Cirque Eloize show before so I loved listening to their gasps and the muttered "oh my gosh" as the performers flew through the air or dropped towards the ground. The sheer strength of the performers is awe-inspiring. It was so nice to spend the night out with friends at such an amazing show! I'm so thankful that Foxwoods Resort Casino invited us and I can't wait to see what Cirque Eloize comes up with next! Double date night! Thanks to @foxwoods for #hosting us to see #CirqueEloize #Cirkopolis! Have you ever seen a Cirque Eloize show? I unfollowed you on social media, but I'm the problem, not you. 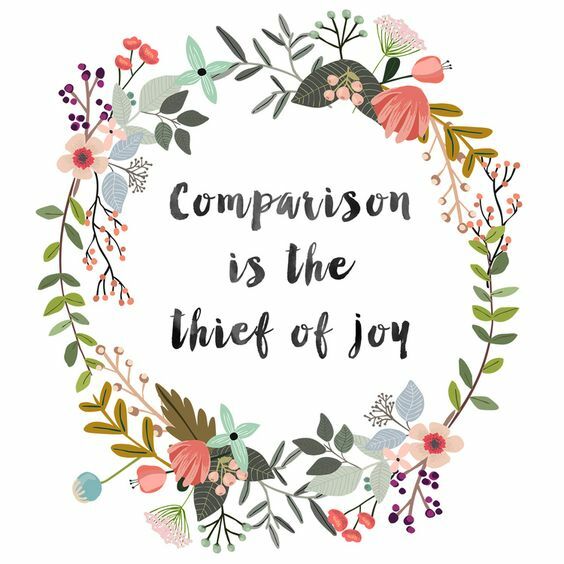 Have you ever heard Roosevelt's famous quote: Comparison is the thief of joy? It's one of those things I heard years ago and it's always stayed in the back of my mind. 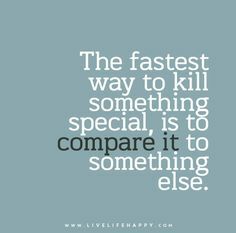 When I compare my life to other things, I try and compare it to where we were 6 years ago. If you need a reminder, we were living in a 2 bedroom apartment in New Bedford, receiving food stamps and on MassHealth. We've worked so hard to get to where we are. I am so proud of how far we've come but sometimes I find myself still comparing my life to what I see on social media... Two or three time a year trips to Disney, bigger houses, newer cars... it's hard to not be envious at times, but then I remind myself that the only person I want to compare myself to... is myself. 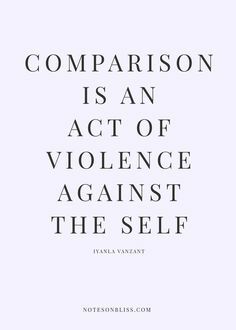 But for some reason, there is one particular person that I can not stop comparing myself to. Our lives are completely different, and not necessarily even where I would want my life to end up, but for some reason, I'm always checking that one particular person's social media. 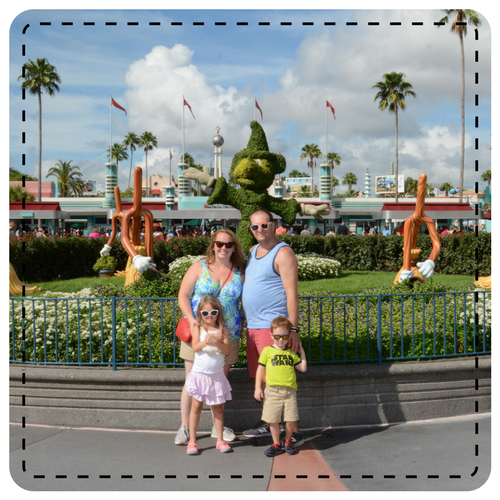 Some days I admire the clothing and poses of the children, wondering why my kids won't sit for such a great picture. Some days I'm jealous of the fact that they are home all day, even if the kids are not home with them. 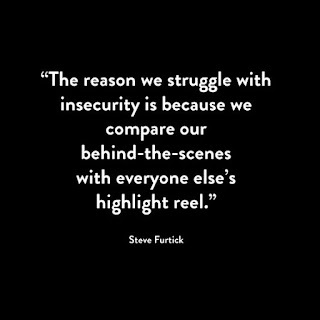 Some days, I am downright mean in my mind, scoffing at decisions that were made or judging what they post. I don't like the more judgmental thoughts- they're mean, and never in my life have I set out to be mean. So I unfollowed that person. I didn't do it because of you, I did it because of me. 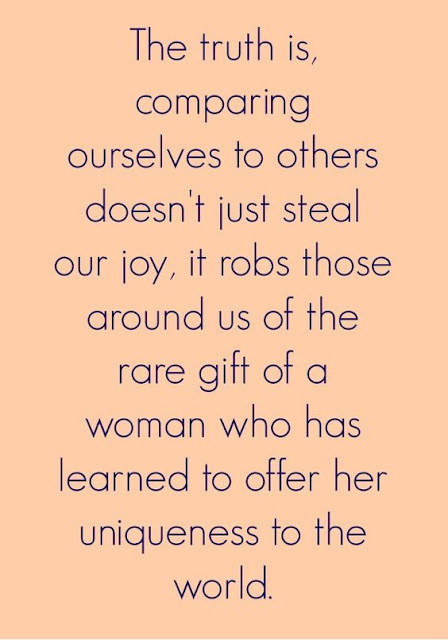 Because I am so in love with my own life that I can't keep looking at someone else's. That I can't keep measuring myself against a ruler I don't actually want. 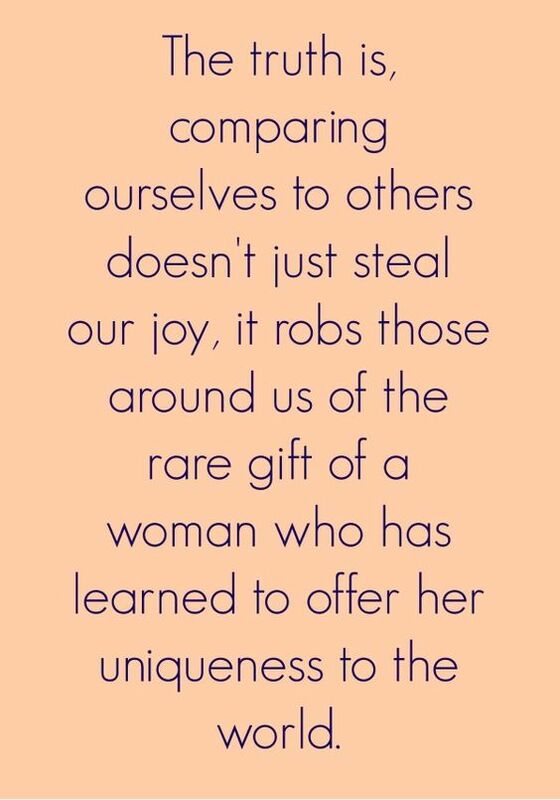 I need to be selfish and continue to work on my self love, so while I'll be cheering on your life successes from the sidelines, I don't want to see them on every social media platform. 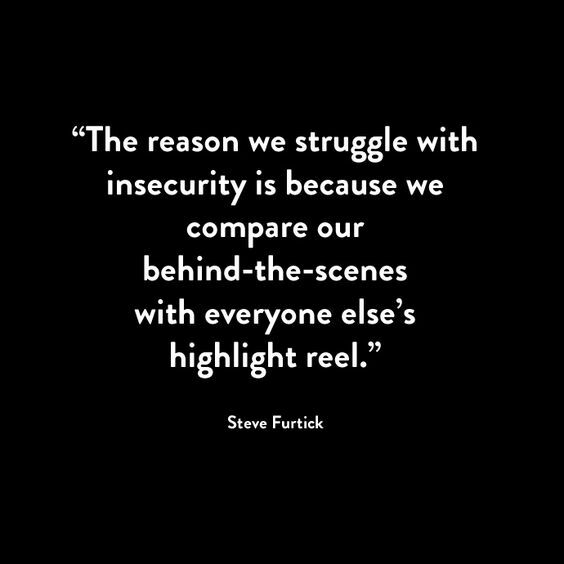 We're in such different parts of our lives and I don't think those paths will ever be the same, so for me, I need to focus on my behind the scenes- rather than on your highlight reel. So, like I said... I'm the problem, not you. And right now, I need to work on me and loving my own life. Easter is this weekend! I honestly love that Easter falls on this weekend because it kicks off our school vacation week. As much as I love teaching, there's nothing better than spending the week on the beach with my own family. We'll spend Easter Sunday at my grandmother's before we head down the Cape for a few days. Holidays with my family are always a big deal. Just on my mom's side, I have 2 aunts and 2 uncles and am one of 20+ grandkids. It's always a very large gathering, plus then we add in my sibling's friends from college who can't get home from the weekend and it's a great day with lots of conversation and food. Because there are so many of us, we divide and conquer with the food. We each bring a few plates and then everyone helps themselves. My mom makes a delish baked ham, and my grandma is infamous for her amazing deviled eggs, so we usually end up covering the sweet tooth, while others fill in with more apps and sides. This year, Emmalee asked for her favorite Krispie Rice treats. Done. They are easy, super delicious, and only take a few ingredients. To dress them up for the holiday, we decided to change them up a bit. Instead of making thick bars, we used a cookie sheet and spread the treats relatively thin. After they firmed a bit, I used holiday themed - Easter Egg - cookie cutters to create festive shapes and then popped them back in the fridge to firm up more. While they're firming, I melted Wilton Candy Melts, grabbed all of our sprinkles, and set up on the kitchen table. Emma was thrilled to see the "chef decorator" set up! 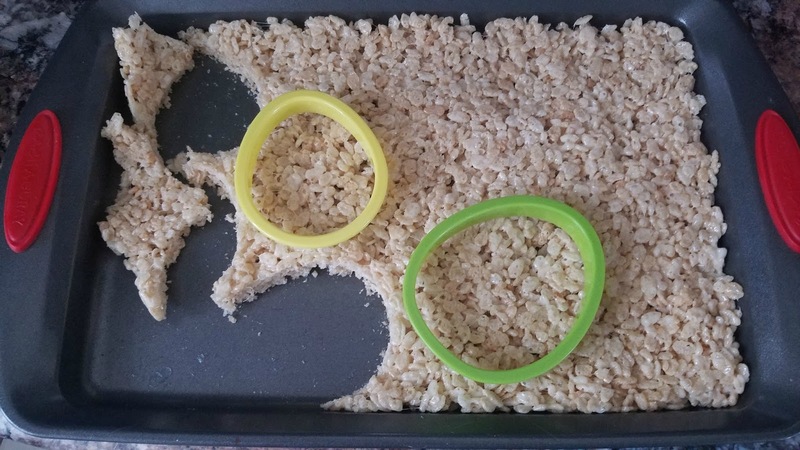 When the Krispie Rice Treats were firm, we got to work! After each was decorated, we put it back on the tray and into the fridge they went to harden the chocolate. I love that this is a really easy and safe recipe for my 5 year old, provided I handle the hot butter and marshmallows. She can push the treats into the tray, use the cookie cutters, and decorate them on her own! 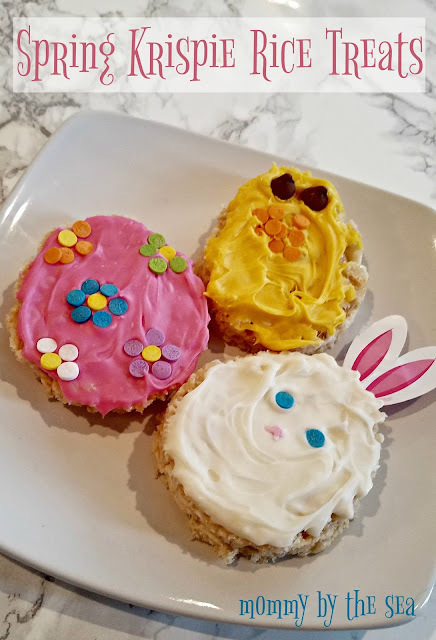 They ended up being such a delicious and adorable treat that is easy to pack and also easy to eat! Unfortunately, they didn't last more than 3 days (which is completely our fault because they are delicious!!) so it looks like we'll be making more this weekend before heading to grandmas! How perfect would these be for all the other holidays as well?